The Shih Tzu is a smart and lively dog ​​who stands out for his self-reliant and proud demeanor. He behaves reluctantly towards strangers but without aggression. The Shih Tzu is one of the companion dogs and adapts to almost any living situation. He has little hunting drive, which also designed the freewheel educational and compared to many other breeds of dogs. The Shih Tzu is a friendly, attentive dog who loves cuddling with his owners, playing and always wants to be near them. 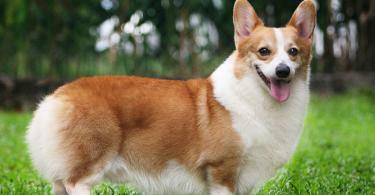 He is well suited as a family dog ​​for families with children. But like every dog, he should also have retreats and the children should be taught not to harass him and to treat him with respect. He is well-compatible with other dogs and pets when his owners value good socialization. After all, he likes to learn here and can be guided without much resistance to show the right behavior. While the ancestors of the Shih Tzu were once bred for spiritual reasons in their Tibetan homeland, the Shih Tzu today is a pure companion dog. 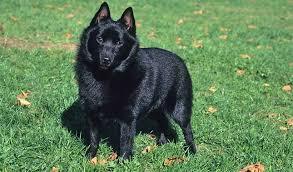 He is also suitable for keeping in small apartments, since he, unlike other breeds also copes with little space. For non-shorn animals, daily care of the hair coat is required. Due to its small size and power, the Shih Tzu can be safely kept on a leash even by small children; His joy in playing and his attachment make him an ideal companion for children. 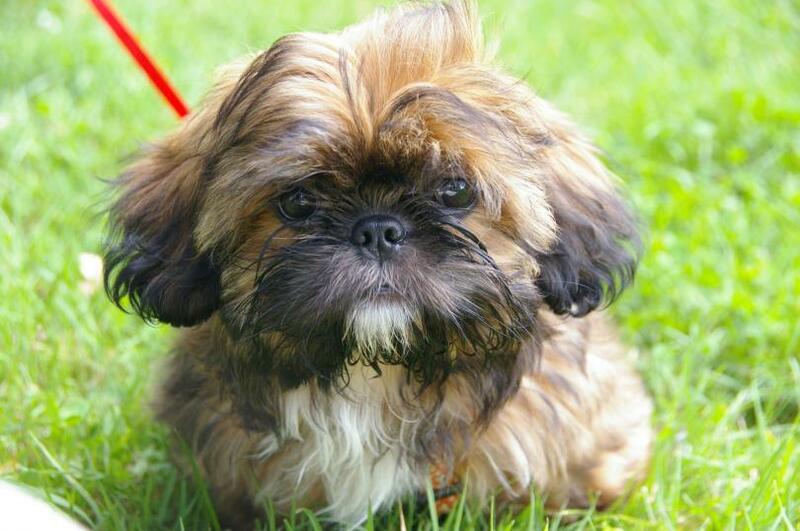 The Shih Tzu was originally from Tibet, where it was prized for its lion-like appearance. Hence the name, because "Shih Tzu" means "lion" or "lion's dog". But he was not only appreciated for his looks, but also served as a reliable guard dog for the temples because of his fine hearing. In China, the Shih Tzu was kept in the royal palaces and after the founding of the Chinese Republic, the first copies arrived in the western countries, where they were recognized in 1934 as a separate breed. The Shih Tzu is a small dog, which according to the FCI standard reaches a size of up to 27cm and weighs up to 8kg. It owes its fluffy appearance to the long, thick coat with plenty of undercoat. It comes in many colors (even pied) and the long floppy ears are often hard to recognize by the many pelts. 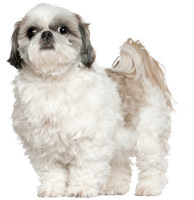 The Shih Tzu has a well-proportioned and beautifully curved neck that is long enough to allow a proud head posture. The rod carries the small, robust dog high above his back, which gives him - also by the pronounced stop and the short nose - a somewhat proud look.